Here’s a whimsical craft that has practical purpose – use our free printable pattern to make a froggy notepad from fun foam for your stick-it notes! 1. 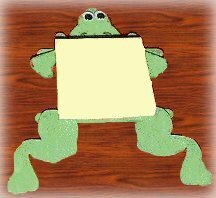 Print out and trace your frog parts pattern on a sheet of craft fun foam. Cut out two arms, two legs and one head. 2. Paint the popsicle sticks or craft sticks green and let the paint dry. 3. Glue the sticks so that they overlap in a square that is small enough to provide support for the stick-it pad. 4. Glue the frog legs to the craft sticks. Do the same with the frog’s arms and head. See photo for details. 5. Stick on the goggle eyes, then draw a nice smile (crooked or otherwise) with magic marker or permanent pen. 6. Glue the stick-it notepad into place, making sure that the sticky edge is torward the head so you can tear off pages as needed. 7. Finally, glue on a magnet for the fridge or use stick-on velcro to mount the notepad near your computer or in your office.